5.87 points at 15 votes (rank 664). 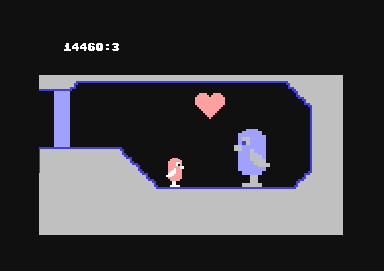 Rombachs C64-Spieleführer 7 September 1984 - "Vote 3"
According to the story a strange species named "snowbird" lives up in the north far behind the polar circle. Snowbirds are likeable and inspring confident creatures that only get angry when they are compared to their distant relatives, the penguins. They are very intelligent and rather good in jumping, but they cannot fly and they also are afraid of water, as contact with this element can get fatal for them. 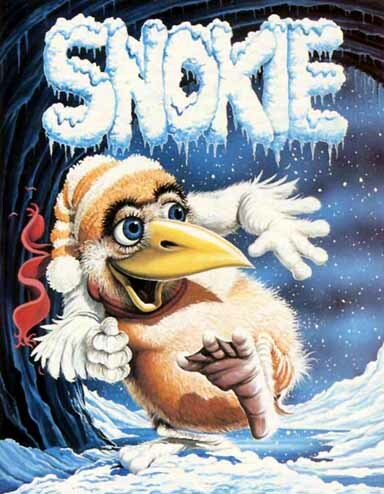 A snowbird named Snokie is the hero of the arctic adventure. Snokie has been separated from his girlfriend Cora. Cora was kidnapped by "Grodies", who now keeps her locked in a snow cave. 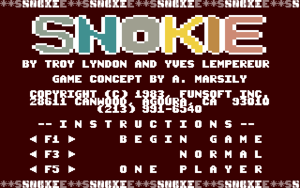 The player has to lead Snokie over an obstacle course and help him to find Cora. Very simple graphic, smoothly scrolling from left to right. There is no music, only tone sequences and FX can be heard. There is only one level, just the same is the difficulty level very high as the game needs exact timing and pixel-precise jumping. Build into the game is a so-called "just for fun"-mode, which allows one after losing all lives to go on playing from the section where the last life has been lost. For this you press the button number for the corresponding section ( 1 , 2 , ...., 7 ). In this mode no points are counted and you also have only one life. 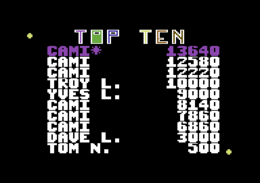 The version by "Remember" offers next to the different trainers a saveable highscore list and the manual. Rombachs C64-Spieleführer: "The graphics is laminar and without depth effect; but anyway nice to look at. It is extremely difficult to manage the obstacle course for only a small part, through which the game gets for some players interesting, but for the most players rather frustrating. Vote: satisfying.". H.T.W: "This game is a flawless Jump-and-Run of the "computer stone age", here one needs to jump pixel-precise and react fast. A calm hand and a precise joystick are needed! Although you can see the year of creation can be seen by the graphics and the sound does not come out positively, the game somehow creates this "I'll try it once more-feeling" . . .". This page was last modified on 11 August 2017, at 18:59.